Most of us must have experienced plumbing problems in our home at some point. If these things do happen, we usually call a professional Middle Village plumber to do the fixing if we don't know how to do it ourselves. In times when there is no available help right away, you need to know some basic plumbing emergency tips to mitigate the problem. While the easiest solution is to keep Bluewater Plumbing, Heating, and Air Conditioning's number handy, there are some things you can do to lessen the damage depending on your plumbing problem, while you wait for your plumber to arrive. There are different kinds of plumbing emergencies at home that you might encounter in the future. Plumbing problems such as leaking pipes, stocked-up sinks, and faucets that won't shut off are just some of the simple plumbing emergencies that you can take care of before help becomes available. It is important to remember, though, that these plumbing emergencies might be simple, however if left unfixed, can cause more serious damage. If you are faced with any or all of these typical plumbing emergencies, it is advised to shut-off the main water control to stop the flow of water. It is also wise to let all the members of the family know the exact location of the main shut-off valve and explain how to properly operate it in case they'll be the one to experience the problem. However, if the problem involves a certain appliance or fixture, there's no need to go to the main shut-off valve. Instead, locate and turn off only the shutoff valve of that particular fixture or appliance, which is usually found under the fixture such as sink or at the back of an appliance. If it is a leaking water pipe, then you have to turn off the main shut-off valve, which is normally located outside your house. The bottom line is to stop the water supply until the problem is taken care of. For clogged sinks, make sure to turn off the faucet. Use a snake or plunger to unclog. Remember not to use any drain cleaners if it the sink is totally clogged as it won't fix the problem. For loosen faucet, turn off its water supply control or the main shut-off valve. 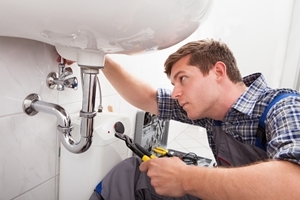 When it comes to fixing plumbing problems, it really should be left to professional plumbers in Middle Village, NY. Changing broken faucets, unclogging sinks, or repairing leaking pipes...if it is not properly fixed, you will suffer the same problem over and over again. So don't leave it up to chance - call the professional plumber you can count on for quality plumbing repairs in Middle Village, NY everytime: Bluewater Plumbing, Heating, and Air Conditioning! "Roger and his crew did a fantastic job with my new boiler and water heater installation. I would highly recommend them and will no doubt call them for my plumbing and heating needs going forward. Their professionalism and expertise are unparalleled." "I just had Blue water plumbing install a new gas boiler, water heater, and move numerous pipes so I could install a clothes dryer and washing machine in a very tight space. The owner Roger came twice to my house, responded immediately to emails and returned calls quickly. The house my wife and I bought had a really old boiler and water tank heater. His prices were lower then several others and he had a can do spirt. Another plumber indicated that you'll never get all equipment (boiler, water heater, washing machine, and dryer) in that small space. He did it and the plumber that installed it Nathen, was neat, professional, and very friendly. They install everything with no cost over runs!" 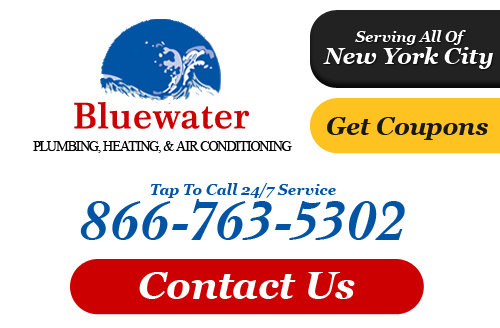 If you are looking for a professional Middle Village plumber or heating contractor then please call 866-763-5302 or complete our online request form.